Soccer fans in the USA can stream and watch all 64 World Cup matches live and on-demand in HD. Sling TV will offer a special streaming service of the World Cup in English, Portuguese, French, Polish and Arabic in their popular International Packages at very attractive subscription rates. The Sling International packages will stream all 64 World Cup matches live and on-demand with natural language commentary in Portuguese, French, Polish and Arabic. All matches are available for viewing for 8 days. This service is available only on Sling in the USA. The World Sports package includes live and on-demand coverage of the World Cup in English and Portuguese. In addition to getting full World Cup coverage, this package also includes the very popular beIN SPORTS and beIN SPORTS en Español which has the exclusive US rights for various top flight leagues in Europe such as the Spanish Liga, French Ligue 1 and others. The World Sports package is available at a discount of 50% if you prepay for one full year for only $80 ($6.67/month). Or choose the $20 for 2-month subscription or $40 for 4-month subscription options. Sling International - Brazilian Package. The Brazilian packages includes live and on-demand coverage of the World Cup in Brazilian Portuguese. This package is available in a 4-month subscription for only $120, or choose the Annual subscription for only $240 and save 30% and include a free ROKU Express. Sling International - French Bouquet Package. The French package includes live and on-demand coverage of the World Cup in French. You can save 30% with an annual subscription for only $120 and get a free Roku. Or choose the $60 / 4-month subscription which includes free ROKU Express. Sling International - Arabic Package. The Arabic Sling package includes live and on-demand coverage of the World Cup in Arabic. This package also includes beIN SPORTS and beIN SPORTS en Español. The Arabic package costs $25/month, but you can save 50% when you subscribe for the Annual subscription for only $150. Sling International - Polish Package. The Polish package includes live and on-demand coverage of all 64 matches of the World Cup in Polish. The package is available for $120 for a 4-month subscription, or save 30% with an annual subscription for $240. This package also includes a free ROKU Express. In addition to getting live and on-demand streaming to all 64 World Cup matches, Sling will also offer 10 bonus channels to enhance your viewing experience. The bonus channels include the following World Cup match feeds for up to two concurrent matches, so in total there will be 10 bonus channels available to subscribers. Sling TV is a cord-cutting service provider owned and operated by Dish Network and offering an expansive array of live cable channels and on-demand content. The popular over-the-top Internet TV service which was launched back in February 2015. Sling TV evolved from the ethnic television service DishWorld also owned by Dish Network. Sling TV offers a flexible service that allows you to build your own package to suit unique viewing preferences. Starting at only $10 per month for Sling World Sports or Sling Best of Spanish packages or opt for the mainstream base packages which start at $20 per month, such as Sling Orange or Sling Blue which offer a good selection of major cable channels without contract obligations. The Sling TV subscription goes month to month until the user cancels or pauses their membership. The Sling TV service is available across most popular platforms for TV, computer and mobile devices. The cost and flexibility of Sling TV makes it a very attractive OTT service for soccer fans looking for alternative options to Cable and Satellite TV. The live streaming service offers extensive programming from a varied selection of channels that have most of the soccer broadcasting rights in the USA for the top international and domestic leagues and competitions. 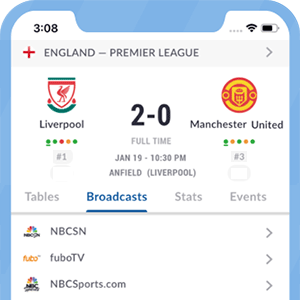 Sling TV offers soccer fans live streaming of the major sports channels broadcasting soccer in the USA such as ESPN, FOX, beIN Sports and more. This live streaming service is restricted to subscribers located in the USA and operates similarly to Netflix or Hulu. Sling TV offers an array of interactive and programming features to subscribers to improve the overall user viewing experience. Below is a list of the major features you should get familiar with if you subscribe to Sling TV. Sling TV offers video on demand (VOD) content as well as catch-up programming on the channels available on the tiers subscribed to. The majority of the shows and movies available on Sling TV become available as on-demand content once it has been aired. The specific content and period that is available will vary based on the channel. The content is listed and search-able in the Available Now section below the schedule bar in the guide. Sling TV allows you to view replay content. To do this, select a channel in the Sling TV guide. Whatever content is available for replay will be listed in the schedule bar to the left of the On NowÂ content.Â To stream the content, simply click on the episode you are interested in watching and then press OK.
Sling TV offers a replay for a period of three days after it has been aired. This is limited to the following channels: beIN Sports, beIN Sports en Espanol an other non-sports channels such as El Rey, HGTV, DIY, Outside Television, Travel Channel, Cooking Channel and Food Network. Subscribers of the Sling TV International package get a whopping eight day replay on all channels available under the same package. Sling TV does not offer a DVR option, but it does offer the ability for the subscriber to pause, rewind and fast-forward the live programming on select channels. Sling TV offers a cool tool to help you manage your viewing. The Watch list is a cool tool in order to flag what you want to watch at a later time. You can use the Watch list feature while you are browsing for content to watch. Once you find something that is interesting, you can click on the title to learn more about the content. You can then save the content title to your Watch list by clicking Save. By saving these titles, you are adding them to your Watch list. The Watch list can be accessed by expanding the contextual menu on the top left corner of your viewing screen. To watch the content, simply click on the title in the Watch list. Sling TV offers Closed Captioning of the live and on-demand programming available on most of the channels on the subscribed tiers. To view the closed captions, just locate the Closed Caption icon CC on the top right of the viewing area. You can enable and disable the captioning with a simple click. Sling TV offers a viewing guide which you can access by selecting GUIDE from the menu icon on the top left corner of your viewing screen. The guide will list channels by icon, the current schedule, and Available Now content.Â You can see all the channels you subscribe to in the channel bar. Below the top channel bar isÂ the current schedule for each channel.Â You can now scroll to the right to see upcoming programming content, or to the left to view programming that has already aired. Content that is Available Now will be displayed below the current schedule. The category feature on the guide will help you narrow the available programing by theme. By using this search option, you can easily identify desired content such as sports or kid specific categories. To access the Filter Channel feature, launch your full Sling TV guide, then scroll to the left to the start of your channel bar. You can click on All Channels and all categories available within your subscribed package will display on your channel bar. To filter the the channels or content, simply select the category you desire. You can now navigate through your filtered channels to see available content for the current day. Sling TV also offers Parental Controls on its service. This feature requires that you create an unique 4-digit pin which will be your password to restrict content. The feature can be activated by enabling the Parental Controls box. To unlock selected content you must enter you four digit pin. To turn Parental Controls on or off, you will need to do this in the SETTINGSÂ page. Sling TV’s Amazon Fire TV App is designed for all Fire TV players. It allows users to enjoy all of the service’s benefits, including a free-trial session, once they get started. Available for all Amazon Fire TV devices. Fire Tablets on Android OS 4.4.2 or higher. Select premium content is also available on Roku where users without accounts can simply create one by entering their contact information and payment method for Channel Store purchases. Minimum requirements are Roku 1, 2, 3, LT, Roku TVs from Hisense and TCL, Roku Streaming Sticks, HS, XS and XD. High speed Internet connection. Subscribers wishing to setup their Chromecast to work with Sling TV will be required to download and install the Chromecast App on their mobile devices. A recent update means that registered Android TV users can now enjoy new content such as ‘Local Now’, whereas ZTE device users are required to run Ice Cream Sandwich 4.0.3 or newer before being able to install and access the Sling TV App. The service’s live and on-demand content is additionally made available to Xbox One â€“ Microsoft’s first-rate gaming console â€“ with a simple installation process that only requires an account to proceed to actual streaming. Available for iPhone and iPad devices with iOS 8.0 or later. Available for Android tablets and phones. Supported on Ice Cream Sandwich 4.0.3 or later. The cost of Sling TV varies depending on the package(s) you choose. You can start watching Sling for only $10 per month with the sports focused packages such as the World Sports package or the Best of Spanish package. Or choose Sling Orange ($20) or Sling Blue ($25) which offer you more mainstream sports channels from Fox and ESPN Networks (See package contents below). With Sling TV you can build up your viewing package by adding a multitude of additional channels through Add-ons which vary from single channel packs like HBO or Cinemax to thematic packages like Sports Extra or Deportes Extra. The add-on packages vary based on the offering, but range from $5 for most packages to $15 to the HBO package. Sling TV Free Trial. Try before you buy. Sling TV offers new subscribers a 7-day free trial. This will allow users to use the streaming service in a normal and unlimited manner. You can cancel the service anytime before the 7 day period is up. If you do not cancel by then, you will be charged the monthly fee for the applicable subscription until you cancel your service. beIN SPORTS USA, beIN SPORTS en Español, beIN SPORTS CONNECT U.S.A.